The last day of our trip had arrived. We trod Lisbon’s ancient cobblestones deep within a damp bittersweet cloud so thick we could taste it. We walked past more of Lisbon’s famous sights and scenes, like the funicular trolley above, trying our hardest to be invested in the final moments of an adventure that had surpassed our expectations in ways impossible to describe. We lunched with the friends Max had met while living in Amsterdam, who introduced us to their new city earlier in our visit. We said goodbye after our meal and added their faces to the collection of people in our memories that, probably unbeknownst to them, compose the substance that will make this trip unforgettable. We drifted up toward the São Jorge Castle, and took in its commanding view of a beautiful city covered today in a gray, albeit glistening, blanket of clouds. The thing had happened. Our minds now existed in that place between what is happening now and what we are expecting to happen next. We had been torn from the moment and now couldn’t ignore the uncertainty that faced us at the end of tomorrow’s international flight. We wandered around the castle grounds taking photos and finally spectated a powerful piece of performance art that was taking place in one of the fortification’s open squares. It was time to descend back into town, toward our accommodation, and into the reality of a life transition that had already begun. Sitting in our last home-away-from-home, packing our backpacks for the last time, a powerful feeling of gratefulness began to mix with and finally overpower the anxious energy of uncertainty. We were over-the-moon lucky to have been able to experience everything in the contents of this blog (and much more) and this good fortune will never be lost on us. The end of anything, especially something as paradigm-shattering as a 5-month trip around the world, is difficult. But as we sat there moving around the beloved fragments of our memory of the trip, rationalizing what had happened and what was to come, it eventually became impossible not to look forward to what was coming next. Wide open future is both scary and exciting. Its endless potential began to materialize in front of us, and we realized that we now had an arsenal of life-changing experiences and lessons on our side, which we had meticulously curated and collected from countries around the world. There is a worn out figure of speech expounding that the only thing you can buy that makes you richer is travel, and in spite of our currently alarming financial situation we certainly did not feel poor. Everything we needed to dig our heels in and walk through that threshold into the future was there, and was not going anywhere. A bag full of souvenirs, a head full of memories, and hands full of one another’s. By our second full day in Lisbon, the penultimate day of our entire trip, reality was beginning to set in. The nomadic lifestyle we had become accustomed to over the past 5 months was about to come to an end; like all good things must. Determined not to let the future of uncertainty seep into our mindsets and attitudes, we set out to squeeze every last bit of enjoyment and adventure we could from this amazing city we were lucky enough to inhabit at that very moment. Cemeteries had become one of our favorite destinations while trying to get to know a new city, so we set out to visit one of the prettiest ones Lisbon has to offer: Prazeres Cemetery (Cemetery of ‘Pleasures,’ which is the name of the parish it originally served). It was created in the 1800’s after an outbreak of cholera swept the city, and many famous Portuguese celebrities are buried there. We enjoyed a quiet walk amongst the decorative above-ground tombs, each enclosed by a colorful door, in this place that seemed protected from the urban clatter waiting for us just outside its gates. From the cemetery we decided to take a joy ride on the entire length of tram line 28. It’s basically the quintessential tram ride of Lisbon; snaking its way through the tight, winding streets of some of the city’s most interesting neighborhoods. It’s a great way to get the lay of the land on a first visit to this awesome city! As sunset rolled around we headed down to the main public transit hub to catch a ferry across the river Tagus to an industrial outcropping called Cacilhas. Walking along the river opposite of Lisbon we passed one abandoned warehouse after another, all adorned with graffiti and murals of varying quality. We passed fishermen and workers winding down the day, packing up their equipment and pausing to look West, where the sun was peaking through the clouds to cover the 25 de Abril Bridge in sharp, radiant beams. We were headed to the restaurant Ponto Final, a favorite memory of Addie’s visit to Lisbon 8 years earlier and one of the only reasons why a tourist would cross the river at the current progress of the area’s development. Aside from fabulous, authentic Portuguese food, Ponto Final provides quite a unique, and slightly nerve-wracking, atmosphere. Part of its footprint includes an old jetty that juts 15 or 20 meters out into the river, unequipped with guardrails of any kind. We were lucky enough to have the best seat in the house; the outermost table situated at the farthest corner of the jetty almost literally floating above the river a few meters below. We watched the light transition from gold to deep magenta as we ate delicious seafood and drank red wine; enjoying one of our trip’s final meals in a state of blissful disregard of everything other than that very place and time. A soft satisfaction buzzed around our heads by the time we got up and walked back toward the ferry. We greeted the cool night air timidly knowing that the last day of our travels sat waiting for us in the morning sun on its other side. What better way to get the sense of a city’s soul than to peruse through metric tons of its mostly unremarkable second-hand items, like those for sale at the Fiera de Ladras Flea market in Lisbon’s Alfama district at Campo de Santa Clara. The twice-weekly market seems to envelop an entire neighborhood. Tents and tables blanket a large cluster of adjacent city squares, chocked full of eclectic inanimates once cherished but now largely unappreciated. The gems do exist though, surrounded on all sides by rough, and that’s where the fun of flea markets exists. It hinges on the potent emotion of discovery, and the hope of spotting something that others passed over unknowingly. We spent a couple hours leisurely drifting among the wares and their owners, eager to find a souvenir to rescue from the pile. We settled on a vintage tin of shoe polish with art-deco Portuguese packaging design that evoked simpler times. Perfect snag. The afternoon found us exploring the district of Alfama. It’s one of the oldest neighborhoods in Lisbon and was originally situated outside of the city walls and therefore filled with poverty and squalor. By now, that reputation has completely disintegrated and the area has become an attraction in and of itself. The ancient district is full of tiny plazas, unexpected viewpoints and endearing shops and cafes ripe for discovering. Its labyrinthine contents are brimming with charm, and we enjoyed getting lost treading its worn cobblestones for a few hours. Later that evening we experienced one of our most enjoyable nights of the entire trip thanks to some local friends that Max had met during his time living in Amsterdam. As a small group we traversed Lisbon on foot; bar hopping, stopping to enjoy the lively sunset scenes at various Miradoras (public squares with scenic overlooks), ducking into hole-in-the-wall stands to take shots of Ginja together, and enjoying a dinner of ‘illegal’ chinese in an inconspicuous second floor apartment clandestine eatery. Elated from the revelry, we were again reminded how much easier it is to slip into the flow of life in a city with the help and hospitality of a local friend. After an early morning exploring trinkets in the local outdoor antique market situated in front of Alcobaca Monestary, we continued our Great Portuguese road trip with a short leg from Alcobaça to Sintra. On the way we enjoyed a lengthy afternoon stopover in Obidos, where medieval castle walls contain a charming town of striking vibrance. 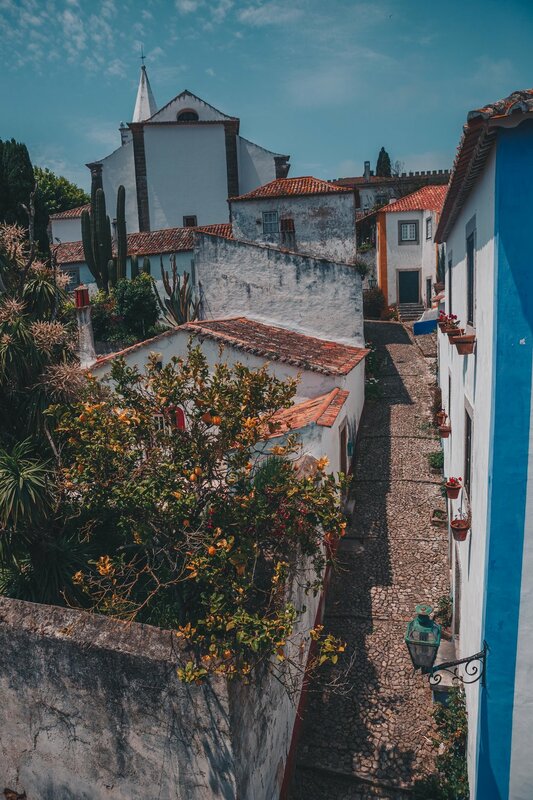 Visiting in late spring, we found the winding cobblestone streets and alleys of Obidos alight with the bloom of all kinds of flowers and vines. The accents of flora affixed to whitewashed walls trimmed with powdery blue and yellow paint combined to create the endearing town’s distinct look. Historically the town is notable for being patronized by the Queens of Portugal. In 1210 King Alfonso II gifted the town to Queen Urraca. From that point on it became sort of a tradition for Queens to sponsor buildings or enrich the town with donations in some way. One of the best ways to appreciate Obidos’ layout and features is through a (free) stroll on its castle walls. The ramparts tower a couple stories over the alleyways below in some places, so the absence of railings and eccentric nature of the ancient cobblestone construction adds a tense excitement to the sightseeing activity. We cautiously made our way around Obidos’ circumference and descended from the walls uneventfully. It was time for a drink. On a visit to Portugal, those of appropriate age will inadvertently end up trying some Ginja. It’s a native liqueur made by infusing sour cherries in alcohol with some other ingredients. Obidos is a well-known producer of both the requisite fruit and sweet, syrupy substance itself. At about 1 Euro per shot, we found sipping it to be a pleasant transitional activity between activities or during a moment of interlude. We decided to duck in a dark, musty and irrefutably authentic joint called Bar Ibn Errik Rex for a taste of the local ginja flavor. The bar was clearly a family run institution in the town. Heaps of ancient Ginja bottles hung from the ceiling above walls adorned with endearingly bad bucolic murals, creating what must be one of the best possible Ginja-drinking environments on the planet. We took our time sipping some tall pours of the pleasant dark liquid. We were definitely on our way to developing a taste for the stuff. Following a lovely few hours in Obidos, it was time again to hop in the car and head to our next stop, Sintra. On the second day of our adventure-packed Porto to Lisbon road trip we set off from Figuera do Foz for the city of Alcobaça, where we had booked accommodation. To put it simply, we ended up taking the “scenic route”; forgoing the direct route down the coast for a jaunt inland to hike and explore the mountainous district of Lousã. Lousã is home to a few dozen remote, mountainside hamlets that are collectively referred to as the Schist Villages. Schist is a stone that is abundant in this region and serves as the main construction material shared by these charming, centuries-old settlements. We mapped out a solid half-day hike that would take us through 3 somewhat adjacent villages. We left the car near the Castle of Lousã and embarked on our big looping route through forested hillsides of cork oaks, pine trees, chestnuts and oak trees perched above fairytale creeks and waterfalls. When we reached the first mountain schist village of Talasnal we were struck by the pleasing aesthetic of the dwellings’ stone exteriors. Around the mid-twentieth century farming and pastoral activity in this area was largely abandoned, leaving many of these villages sparsely occupied. Though a portion of the villages’ buildings were abandoned and decaying, we found plenty of well-manicured homes and delightful cafes, bars, shops tucked into maze-like alleyways. After satisfying our exploration bug, we descended back into the valley and hopped in the car to go grab lunch and then finish our drive for the day. On a whim we hopped off the highway when we saw a sign for Batalha Monastery. We happened upon a small family-friendly town fair in progress in the shadow of a jaw dropping building decked out to the nines in Late Gothic style accouterments. The Monastery was built over more than a century from 1386 to 1517 to thank the Virgin Mary for the Portuguese victory over the Castilian during the battle of Aljubarrota. We meandered through the stalls of vendors selling their crafts before entering the building and enjoying the light-show put on for us by the late afternoon sun and the building’s gorgeous expanses of stained glass. Pleasantly stunned by the awe-inspiring edifice that is Batalha Monastery, we finished our drive to Alcobaça and enjoyed some supermarket wine and a relaxing evening in our home-away-from-home for the night. We got straight to work using our only full day in Porto to hit as many of the charming city’s major sights as we could. In order to enrich our little touristic romp we decided to book a local guide for half of the day (via WithLocals) who would provide some deeper knowledge about some of the city’s well-known attractions. The most fitting place to start such a tour is irrefutably Sao Bento Train Station. 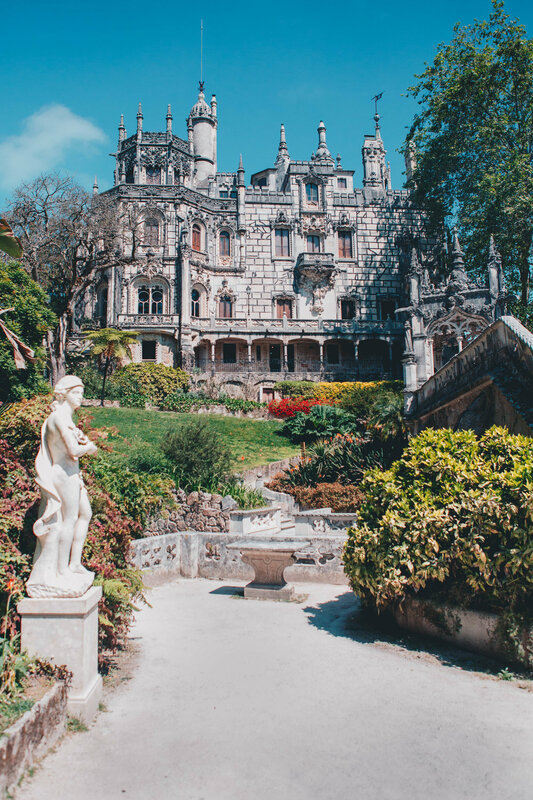 Built in 1900 by the prominent and prolific architect José Marques da Silva, the French Beaux-Arts style building contains an ideal introduction to the world famous tradition of hand-painted Portuguese tile work. In the lobby of the station visitors are treated to a visual history of Portugal with some of its major events depicted on a grand scale using around 20,000 meticulously placed, hand rendered ceramic tiles. For the next few hours we casually walked around Porto’s center and conversed with our guide. Before the tour was over we had seen the most beautiful McDonalds in the world (McDonalds bought and built out a store in a historic, early 20th century imperial cafe), the strikingly narrow profile of the famous Clérigos Tower and a former prison that had been transformed into none other than a photography museum. After we said goodbye to our WithLocals guide, we decided to take a closer look at an attraction that we had walked by briefly on the tour. Livraria Lello is one of the most beautiful bookstores in the world. In fact, JK Rowling is said to have taken a great deal of inspiration for the interior design of Hogwarts from this 100+ year old bookstore that looks straight out of a fairytale. Intricate woodwork, gothic details, stained glass and a red spiral staircase work together to create a rather stunning cathedral to the written word. Being one of the most popular attractions in the city, a ticket is required for entry to the store, and it is almost always full of people. We had to wait about 15 minutes to get a photo of the red staircase with nobody on it, but ended up liking this one more; as the well-dressed man seems to be descending into the gaping red mouth of the building. We ended up purchasing a couple of books before leaving. The price of your ticket goes towards the purchase of a book, which is a brilliant marketing scheme honestly. Leaving the bookstore we headed to our last major site of the day, The Crystal Palace Gardens, to drink wine and watch the sunset with our new expat friends Justin and Bella. Afterwards we all grabbed a bite at a local spot famous for its Francesinha - a porto originated sandwich made with bread, wet-cured ham, linguiça, fresh sausage, steak or roast meat and covered with melted cheese, a hot thick tomato, beer sauce and served with french fries. Feeling sufficiently stuffed, we then wandered around the dark and deserted Porto street blocks and enjoyed having the city virtually to ourselves. Men had been working all day blocking off major streets and thoroughfares for a big rally car street race that was to happen the next day. They gradually pushed tourists and locals alike back home or into narrow pockets of the city, now echoing with the sound of carefree reveling. And just like that, seemingly as soon as we had met up with Max’s parents, it was time to say goodbye and head out from Trogir. 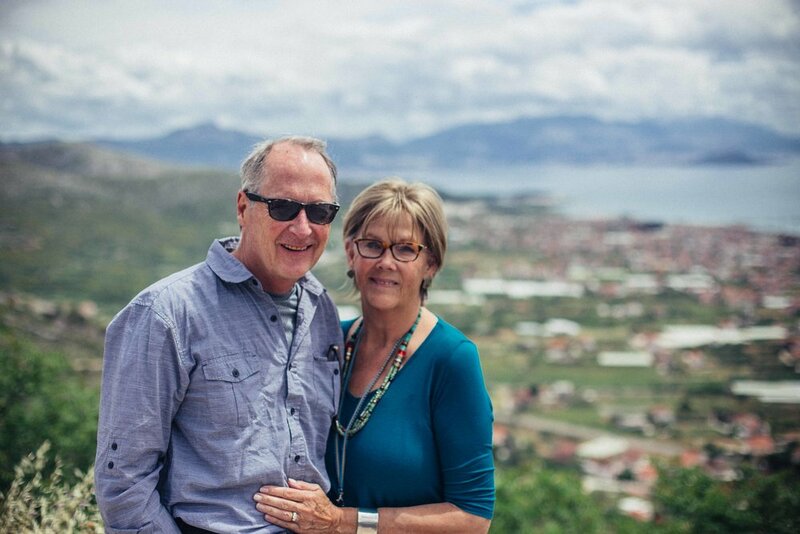 We drove together to the Split airport at the crack of dawn to part ways with Di and Thad and embark on the final leg of our trip; Portugal. After an uneventful two flights (stopping over in Geneva), we landed in Porto and picked up another trusty, petite manual European rental car and drove from the airport to the center of town. Passing facade after facade of celebrated Portuguese tile work, we finally pulled up to our accommodation in the rather fetching neighborhood of Baixa/Sé. After settling in, our first official order of business in Portugal was to find some local dinner fare. At this point in the trip, we had become seasoned experts at uncovering the best possible price for quality ratio in our vicinity. We exercised our honed, food-seeking senses and landed on Murça No Porto, pictured above. For 5 and a half Euros, each diner received bread, soup, entree, desert, coffee or tea and a half liter of wine. Looking back, this meal was an ideal preview of the quality of experience we could look forward to in Portugal. Our rendezvous with Max’s parents had basically consisted of exploring ancient towns, swimming in the Adriatic in front of our apartment, eating great seafood and imbibing alcoholic refreshments. This was a daily structure we could get used to. In keeping with these motifs, our last full day with Di and Thad was spent exploring the ruins of a Roman villa and then the old town of seaside Sibenik. We reveled in the town’s laid back, less touristic vibe as we took in some sights and sounds. Pictured above is the UNESCO protected Cathedral of St. James. Despite the cornucopia of cathedrals and religious sights we had been savoring for most of the trip, it was still hard not to be impressed with the scale and craftsmanship of this one. In fact, St. James Cathedral is considered the most important renaissance era architectural monument in Croatia.